Over the holiday break, I got hooked on HBO's The Newsroom. I love the witty writing, characters, and behind-the-scenes look into live news segments. 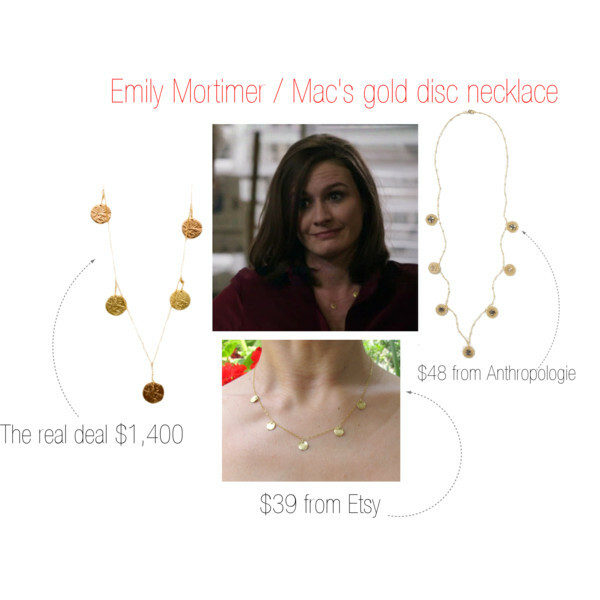 Fashion-wise, Emily Mortimer aka MacKenzie "Mac" McHale plays up her executive producer style with chic blouses & simple jewelry. She often wears this Domnique Cohen necklace which I immediately searched for...turns out not so much in my budget. But, these two options, from Etsy and Anthropologie, are each under $50. Anyone else a fan of The Newsroom? I can't wait til June 2013 when season 2 starts! i'm also obsessed, it's so good! cute! i love the gold ones that have initials on them! I am so obsessed with that show! It's so smart & witty. Love this necklace, too! I'm awed with the price difference! I mean, that's a thousand dollars,yes? Well, if Emily can wear it, I should not be this shocked. However, there are alternative online stores also that sell the same quality of this necklace with a bunch of price difference. Stunning necklace! I saw something like this online, and I must agree with Cerys that it's pretty expensive! The necklace is very simple, yet one should pay a thousand dollars for it. Good thing there's so many alternative online stores for this kind of jewelry, with the same qualities of products. I noticed this one also, though I think it's prettier if it's more obvious since the gold discs are small. Where can I find the ones with initials on them? i've seen them on Etsy! I've been obsessing over the newsroom and this necklace as well! Thanks for providing all the alternatives- will def have to get myself one. Too pretty. Does anyone know what handbag she uses in the season finale? Is it a Celine?